There were several electronic citation changes that took place at the New Year. All electronic citations were required to have 12 digits by the State Courts. Additionally, fine schedules that were printed on the violator copy have been replaced by mandated language on violator rights and obligations. In place of the fine schedule are a phone number and a web site for the violator to use to determine the fine for their violation. Updates were pushed out to all squads at midnight on January 1, 2012. LOGIS created and provides an Electronic Citation Report which is a reproduction of the ticket from the data exported from the citation. Many agencies receive this, alleviating the need to print a second citation. Most courts also get the report from LOGIS to assist in their business needs. In December Network Services released a SharePoint site for use by Dakota County and several Dakota County cities. This site’s primary function is to simplify the sharing of court case information between the county and the participating cities. LOGIS just completed the upgrade of our MeetingPlace to version 8.6 which incorporates the WebEx desktop and video control into our meeting environment. Now our staff will begin to rollout this new environment out to participating IP Telephony members. Active Network, the developers of Class—the LOGIS Parks and Rec system—have a very useful eMarketing Center web site. The template section of the eMarketing Center is your go-to platform to take your Parks and Rec communications to the next level. Choose among the large selection of templates and customize them with your banner, colors and logo in just a few clicks! Ask and you shall receive. Active Network has added 5 new templates to help you promote your activities and boost your registration. Download the new templates now! Looking for some inspiration? 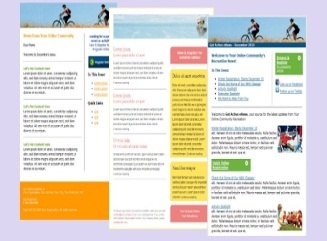 Take a look at how organizations like the Town of Duxbury, MA have customized the templates to boost their registrations. Get inspired now! If you have any questions about the templates or need help accessing the eMarketing Center, contact LOGIS at 763-543-2600. The 2011 Legislature repealed the homestead residential Market Value Credit (the agricultural credit did not change), and enacted a similarly designed homestead Market Value Exclusion. This change is effective for taxes payable in 2012. Program changes have been completed to accommodate the new way of calculating Taxable Market Value. This year instead of giving a Homestead Market Value Credit, a Homestead Market Value Exclusion will be applied to the Market Value for home owners to reduce the Taxable Market Value. Validation of program changes is near completion and a new version will be released in the near future. The cities are on their way to completing the bill print outsourcing project in 2012. LOGIS will no longer be printing the utility bills for our member cities and the cities have been searching and making selections for mailing vendors to print their bills from an electronic file. Currently, five cities are sending “live” electronic files to their mailing vendors. A group was formed several months ago consisting of ten LOGIS cities that combined their resources in a mailing vendor search. The group prepared an RFQ, reviewed responses, and held a meeting with the vendors. After narrowing the search to three vendors, the group made site visits to each company. After research, cost evaluation, and vendor assessments, the group selected Impact Proven Solutions. Implementations will begin in January and the entire project will be completed by 2nd quarter 2012. The latest PIMS version is currently in test with a large selection of new changes and improvements. Some of the modules that will be affected are: Business License, Code Enforcement, Contractors, Database Utilities, Inspections, Permit Entry and Septic to name a few. While there are still a few items in programming, we hope to roll out this update to all the cities within the next few weeks.